Nike Cross National champion Katelyn Tuohy has just one more 5K on her schedule, and it will be the fastest of them all. On Saturday, January 20th, LIVE ON FLOTRACK, she will toe the line at the VA Showcase at Liberty University in Lynchburg in a special section of the 5K with the sole purpose of taking down Brie Oakley's 15:55 national record from last March in New York. 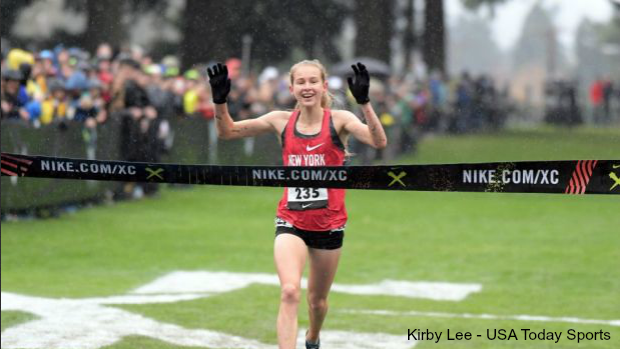 Brie Oakley set record at New Balance Indoor Nationals early this year -- and she did so after winning her first NXN title. The difference, though, is that Oakley won NXN in 17:10 while Tuohy just clocked a meet record of 16:44 in much wetter conditions. The math speaks for itself: this is going to be a fast race. The North Rockland (NY) sophomore will want it to be a fast one too considering she will be more focused on the 1K, mile, and DMR for the rest of the season. Another closer-to-home comparison would be Tuohy's 13:21 4K record at the Manhattan Invitational this October. Her speed rating for that race equates to a 16:40 on Oatlands. That beats Weini Kelati's meet record by 31 seconds, and Kelati went on to run 16:05 indoors in the 5K. Already jumping at the opportunity for a fast qualifier and a chance to race Tuohy is Blacksburg's Kaitlynn Wolfe, who ran 17:31 in XC this season. Both will be joined by a couple other sub-18 girls in what should be a great display of speed and endurance. Entries are open until January and this meet is sanctioned for VA, NY, NJ, PA, NC, DC, MD, OH, and DE.